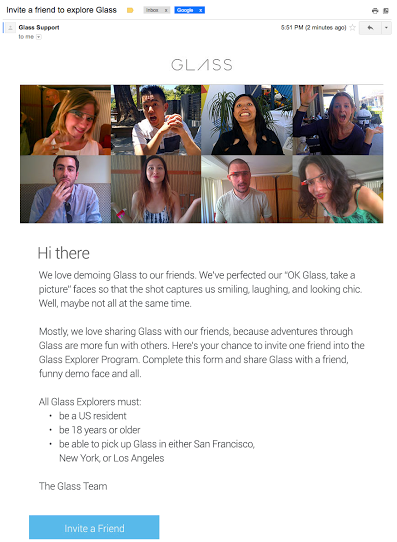 The next phase of Google Glass’ plans for expansion prior to 2014’s consumer release came via email today. Ryan Mott got a Gmail letting him know he could invite a friend to the Glass Explorer program. There are several caveats to that invite, the person must pick up in NYC, LA or SF be a US resident over 18 and have the requisite $1500 +tax to get their own Google Glass. Who will you invite to the program if you get an invite? There have been ebay postings about selling #ifihadglass units in the past through Google was usually quick to put a stop to them, will they also try to squash folks trying to recoup their Glass expenses by auctioning off their invite slot?